Official Contest Rules — . Please feel free to submit your photos, poem and/or short story outside the suggested category list. We recognize that animal rescue is a very broad subject with limitless dynamics, ramifications and possibilities. Please feel free to create a new category that allows you to share your unique rescue experience in your own way. The Contest ends April 17th, 2016, at 11:59 pm CST (the Entry Deadline). All entries must be received by the Entry Deadline. Employees of American Cedar Technologies and each of their affiliates, subsidiaries and agents, and their immediate family members (spouse, parent, child, sibling and their respective spouses, regardless of where they live) or persons living in the same households of such individuals, whether or not related, are not eligible to enter or win a prize. Entrants must be at least 18 years of age as of the date of entry. CONTEST IS VOID WHERE PROHIBITED. To enter electronically, please visit www.killbugsnaturally.com/my-amazing-rescue to register. Once the registration process has been completed, you will receive an e-mail confirmation. Simply follow the online instructions. Each entrant may submit for any or all of the three creative platforms; Photos, Poems or Short Stories. Please submit your Photo(s), Poem or Short Story via our dedicated contest email at myamazingrescue@gmail.com. Short Stories and Poems must be submitted as a word document, AS AN ATTACHMENT. Align all text to the left, use spaces to separate paragraphs and use 12 point Times New Roman font. Digital images should have a long dimension of AT LEAST 1,000 pixels and be saved as a jpeg. We recommend the uncompressed file size not be larger than 4 megabytes to ensure a fast upload experience. We can accept a maximum of 3 images per photographic entry. In your email SUBJECT LINE please identify the Suggested Category you are submitting for along with the WORD COUNT of your Short Story or Poem or NUMBER OF PHOTOS you are submitting. In the body of your email please include- Your First and Last Name, Current Address, City, State, Zip Code and Best Contact Phone Number. Mail-in entry is not available for this Contest. Each Entry consists of an entry form, a single image or series of images (3 Maximum), a single Short Story or a single Poem per Suggested Categories. You will find the entry form at http://www.killbugsnaturally.com/my-amazing-rescue, look for the button at the bottom of the page that says "Sign Up For Contest Here"
Each submitted Photograph, Poem or Short Story in its entirety, must be a single work of original material taken or written by the entrant. By entering the Contest, entrant represents, acknowledges and warrants that he or she has full power and authority to enter the Photograph, Poem or Short Story and that the submission does not infringe any copyright or violate any other intellectual property rights. The entrant agrees to indemnify American Cedar Technologies from any and all third party claims arising from the Photograph, Poem or Short Story. If the Photograph includes other people, you must be prepared to provide a signed written personal release from all persons who appear in the Photograph submitted, authorizing use of the Photograph. If you are unable to provide a personal release, upon request by the Sponsor and in the form provided by the Sponsor, then your entry may be disqualified. You do not need to send the release with your entry. If you win, we will contact you if a model release is needed. The entries will be judged in accordance with the Judging Criteria, as defined below. The photograph must not, in the sole and unfettered discretion of the Sponsor, contain obscene, provocative, defamatory, sexually explicit, or otherwise objectionable or inappropriate content. Photographs deemed inappropriate will be disqualified. ALL ENTRANTS will receive an on-line discount coupon good for a 10% discount on any item available at www.killbugsnaturally.com. On-line coupons will be sent to ALL ENTRANTS on Tuesday April 19th, 2016 and will expire after 60 days. Each category winner will receive a Give Fleas The Brush Package that includes The ACT ALL ANIMAL DISPENSING FLEA BRUSH and a 16-ounce bottle of the parasite control formula of your choice: BEST EVER, INDUSTRIALISIMO, 4-KAT or 4-K9. Contest consists of two (2) rounds of evaluation. In Round One, our panel of Judges will each review the entries and select a group of entries in each Category to proceed to Round Two. In Round Two, the Judges will collectively select, from among the entries selected in Round One, selecting 1 winner in each Category. Limit one prize per winner. Entries will be judged on the basis of creativity, emotive quality and poignant content. Winners will be published in the February 2015 ACT newsletter. 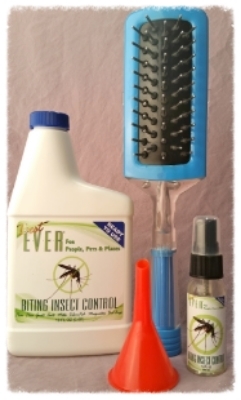 Additionally we will feature select winner entries at www.killbugsnaturally.com. Judges reserve the right to create new categories at their discretion. Decisions of the Sponsor and Judges are final and binding. Sponsor reserves the right not to award all prizes in the event an insufficient number of eligible entries meeting the minimum judging criteria are received, as determined by the Sponsor and Judges in their sole discretion. By participating, ALL ENTRANTS grant the Sponsor and their designees, licensees or affiliates (the "Authorized Parties") a non-exclusive, worldwide license, to reproduce, distribute, display and post the entries online so that viewers may view all competing entries. In addition, each grants to the Authorized Parties a license for use of his/her winning entry in connection with the Contest and promotion of the Contest, in any media now or hereafter known, including but not limited to, print or digital publication, video production, broadcast television or radio. Authorized Parties will not be required to pay any additional consideration or seek any additional approval in connection with such use. By participating, entrants agree to release, discharge and hold harmless American Cedar Technologies and each of their respective partners, affiliates, subsidiaries, advertising agencies, agents and their employees, officers, directors, and representatives from any claims, losses, and damages arising out of their participation in this Contest or any Contest-related activities and the acceptance and use, misuse, or possession of any prize awarded hereunder. The Sponsor assumes no responsibility for any error, omission, interruption, deletion, defect, or delay in operation or transmission; communications line failure; theft or destruction of or unauthorized access to Contest entries or entry forms; or alteration of entries or entry forms. Sponsor is not responsible for any problems with or technical malfunction of any telephone network or lines, computer online systems, servers or providers, computer equipment, software, failure of any e-mail entry to be received on account of technical problems or traffic congestion on the Internet or at any Web site, human errors of any kind, or any combination thereof, including any injury or damage to entrants' or any other persons' computers related to or resulting from participation, uploading or downloading of any materials related to this Contest. Participants also agree (a) to be bound by these Official Rules; (b) that the decisions of the Judges are final on all matters relating to the Contest; and (c) if he/she wins that the Sponsor may use each winner's name, photograph, likeness, and/or voice in any publicity or advertising relating to the Contest or future promotions without compensation or approval (except in Tennessee and where prohibited by law). All federal, state and local taxes, fees and surcharges on prizes are the sole responsibility of the prize winners. In the event that the selected winner(s) of any prize are/is ineligible or refuses the prize, the prize will be forfeited and the Sponsor, in their sole discretion, may choose whether to award the prize to another entrant. If for any reason the Contest is not capable of running as planned, due to infection by computer virus, bugs, worms, trojan horses, denial of service attacks, tampering, unauthorized intervention, fraud, technical failures, or any other causes beyond the control of the Sponsor that corrupt or affect the administration, security, fairness, integrity, or proper conduct of this Contest, Sponsor reserves the right, at their sole discretion, to disqualify any individual(s) who tamper with the entry process, and/or to cancel, terminate, modify, or suspend the Contest. If Sponsor elects to cancel or terminate the Contest, Sponsor will not retain any rights in the submitted photographs.